This recipe is crying out for a table in the garden, laid out ready for friends to come round and enjoy a light, summery evening meal. It’s very quick to make, leaving me plenty of time to sit and chat and enjoy the sunshine. Cook the pasta in a pan of boiling salted water for 10–12 minutes until al dente. Meanwhile, blanch the broccoli in boiling water until tender. Drain and refresh under cold water, then slice the stems, keeping the heads whole. Set aside. In a large pan, heat a little oil and fry the spring onions and chilli until translucent and tender. 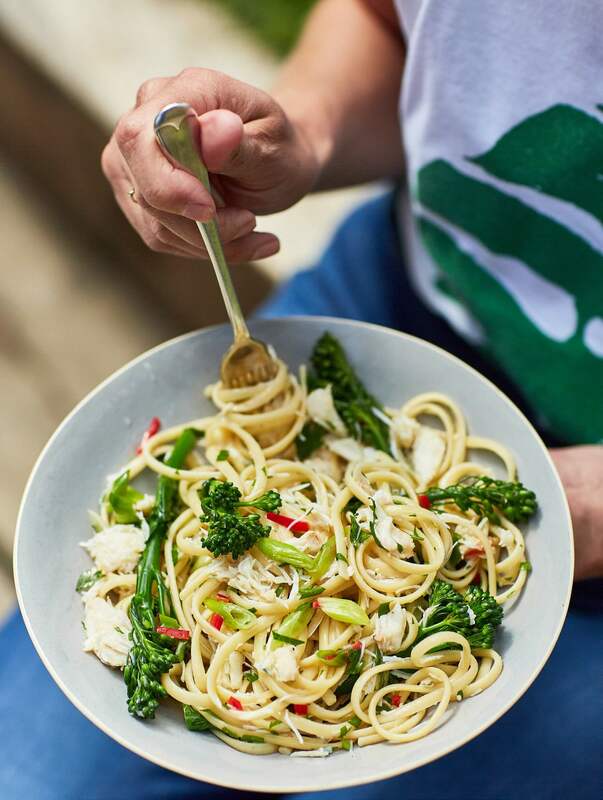 Add the cooked pasta with a splash of the cooking water to the frying pan, then stir through the broccoli, crab meat, parsley and lemon juice to taste. Season well and tip into a large, warm bowl, drizzle with extra virgin olive oil and serve.